Dethatching is serious business, and while going at it with a thatch rake is a viable solution for small sized lawns with a mild thatch situation, for larger, mid-sized lawns it simply isn’t practical. Alternatives like renting out a power rake or hiring professionals to come in and tackle the problem for us do exist, but some of us prefer the DIY approach, not just because we might end up saving some cash (as long as we make the proper investments) but also because it’s comforting and reassuring to be able to take care of our own lawns without having to rely on a third party. For small to medium sized lawns, a riding mower mounted with a tow behind dethatcher is obviously not very practical (and completely counter-intuitive in the cost-benefit analysis) but there are some rather impressive, compact and corded electric dethatchers out there hitting the right marks for storage- and user-friendliness, without breaking the bank or the back. Trumping their gas-powered cousins by being more lightweight (and therefore less cumbersome to use, especially by anyone who might find physically raking or pushing a heavy machine around taxing), as well as environmentally friendlier, here are our picks for the best electric dethatcher. Why go for bulky, environmentally-polluting gas powered units when you can settle for this efficient, fuss-free machine instead? Getting started is as simple as pushing a button, with no tugging and yanking at pull cords, the unit capable of dethatching swaths of 14 inches with each pass, perfect for small to mid-size lawns where investing in a machine any larger would be wasteful. Despite the size, this dethatcher packs quite the punch – three adjustable tine positions allow you to tackle mild to tough thatch, their rotating movement teasing out the matted plant matter so you can easily collect and dispose of it or repurpose it as mulch. A set of 18 stainless steel tines – with replacement tines – comb through the ground and gently but effectively remove thatch strangling up your grass without disturbing the grass growth. 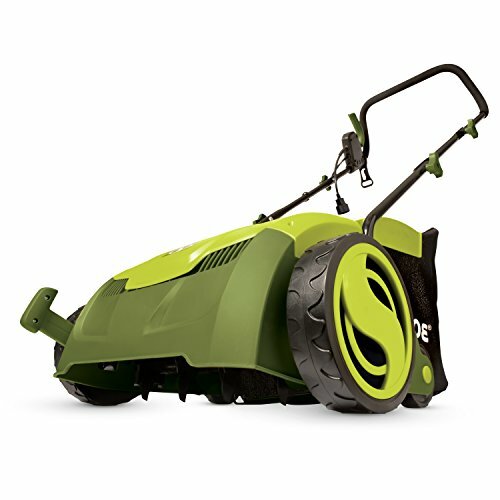 The unit is designed with user-friendliness in mind, the ergonomic and adjustable handlebar with the start button at your fingertips letting the DIY lawn keeper get at the dethatching business without expending too much elbow grease. In fact, thanks to its lightweight but sturdy build and 10-amp motor, anyone who might have difficulty manning a thatch rake, for instance elderly individuals or those with conditions like back pain and arthritis, can take on the unit without putting excessive strain on themselves. An integrated cord lock prevents the cord from disconnecting when you’re at it, 7 and ½ inch wheels allowing for easy maneuverability. 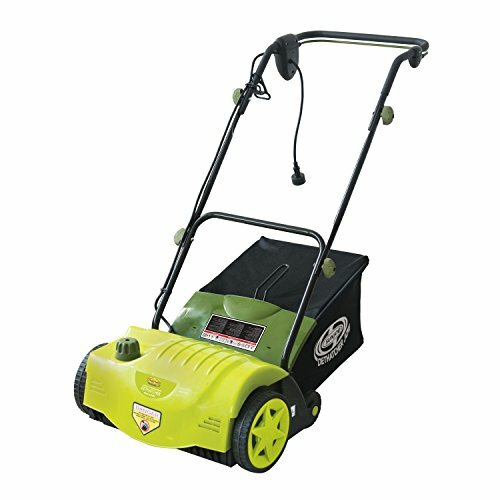 Don’t underestimate this machine – despite the budget-friendly price tag, this is two in one scarifier and dethatcher is engineered with AirBoost Technology to enhance its ability to remove thatch and debris, rotating spring steel tines for extra durability cutting through the ground to remove thatch without disrupting the growth of your turf. 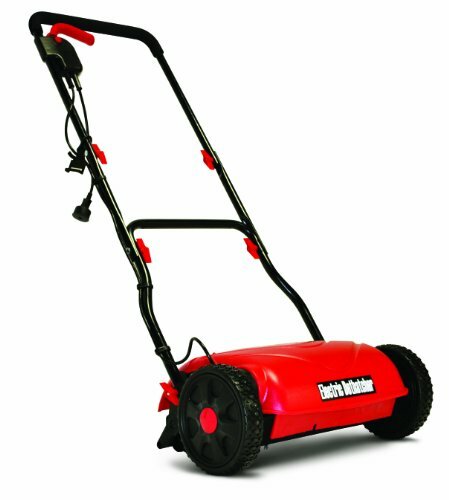 Cutting swaths 13 inches wide, the unit features 5 adjustable depth positions to let you tackle anything from lightweight to serious thatch problems for small to medium sized lawns, all with this compact and inexpensive machine. A 12-amp motor gives you the firepower you need to get started, the push of a button giving you instant start-up without needing to mess with any pull cords, heavy-duty all terrain wheels letting you take on your lawn with ease. The unit features a dethatcher cylinder with durable and sharp stainless steel tines, as well as a bladed scarifying cylinder for cutting grass roots on occasion to encourage healthier and lusher grass growth. The dethatcher wins extra points for the inclusion of the detachable 8 gallon bag you can use to collect and dispose of thatch, making your job much less cluttered and messy. 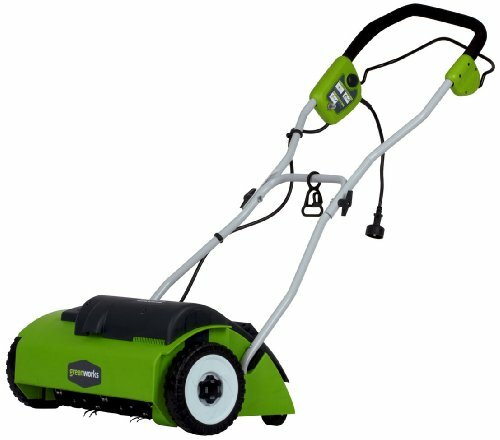 Capable of clearing out swaths 15 inches wide with each pass, this unit also offers tool-free height adjustment to work out the right dethatching intensity required for your lawn’s needs. The perfect lightweight and compact unit to tackle areas of 1000 square feet or less, a simple start-up switch powers the machine on, while a rugged pair of wheels with treads capable of handling grassy terrain, and a cushioned handlebar, make maneuvering and dethatching with this machine much less arduous than using a bulky gas-powered giant or a heavier rental. Rotating spring steel tines sink into the ground for effortless thatch removal, giving you your money’s worth without eating out too great a chunk of your budget or storage space. Capable of clearing out swaths 14 inches wide with each pass, this dethatcher, like our budget pick, features 5 adjustable tine heights to let you get at the deepest and thickest of thatch, while still taking it easy on your lawn. Tool-free height adjustability lets you set the position you need anywhere from -0.12 inches to 0.35 inches, AirBoost Technology enabling 24 spring stainless steel tines to effectively rake out thatch and debris without digging out your grass. A powerful 11-amp motor cuts down on the need for frequent maintenance or the problem of spewing out environmentally polluting by-products, an instant start system and ergonomic handle allowing you to get down to business with the simple push of a button. The push handle comes with the start button and a safety switch within easy reach, a collection bag attachable to the unit to collect and hold thatch as you remove it to keep the operation mess- and clutter-free.